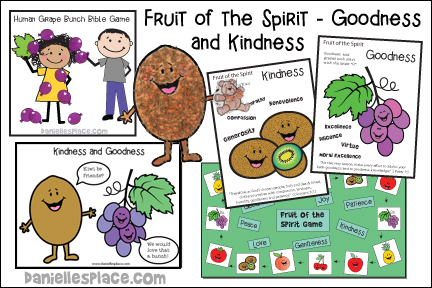 Squirmy the worm uses the Fruit of the Spirit, goodness and kindness, when he shares his tomato with the class. Your children learn how Dorcas showed goodness and kindness to others. Complete lessons are available to members on The Resource Room. Available in both color and black and white. Use the colored patterns as posters to decorate your bulletin board or the black and white as coloring sheets. Use grape Kool-aid with a little water to make a great smelling paint to paint the grapes. Children color the kiwi and then glue on crinkled up, shredded brown paper to make the kiwi fuzzy. 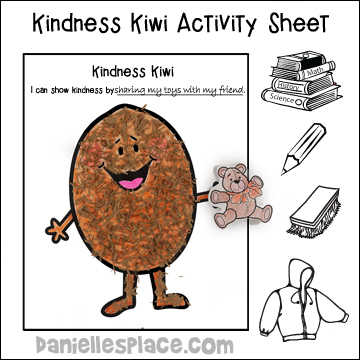 Then they pick a picture that reminds them of something they can do to be kind, color it, and glue it to the kiwi's hand, and write a sentence about how they can be kind. The kiwi says, "Kiwi be friends?" and the grape answers "We would love that a bunch!" 2. In class have your children color the picture. You can use powdered grape Kool-aid mixed with a little water to make a nice smelling paint to paint the grapes. 2. In class divide your children up into teams of four or five students. Give each team about ten balloons, and a large leaf. 3. Let your teams decide which teammate should be the human grape bunch. 4. On the word go teams should try to make their designated teammate a human grape bunch by rubbing balloons on the child and trying to get them to stick to the child. After about one minute call time and see which team has the biggest grape cluster by counting the balloons stuck to the designated child's body. Play "Pin the Grape to the Branch"
2. Before cut out the leaves, game pieces and cluster. Also cut a strip of paper from brown construction paper for the vine. 3. Glue the leaves, vine, and grape cluster together and then glue it to another sheet of paper to make the board. 4. Display the board in front of your room at your children's level. 5. In class give each child a grape and ask him to tell you one thing that he can do that is good. Write what they say on the grape, and then give them a piece of rolled up tape. 6. Blind fold the child, turn him around a couple of times and see if he can stick his grape to the cluster of grapes on the wall. The object of the game is to be the first team or player to color in all the fruits on the fruit sheet by landing on the corresponding fruit and answering questions correctly. To play: Players set their markers on the board on any fruit picture they would like. They take turns rolling a die and moving that many spaces. The player or team must then answer a review question. If they answer the question correctly, they get to color in the corresponding picture on their fruit sheet. If they don't answer correctly, the next player/players take their turn. If a player have already colored in a picture that corresponds to a picture on the board, he just tries to answer the question. He does not get to color in another picture. The team or player that colors in all his fruit pictures first wins. Read "The Kindness Quilt" by Nancy Elizabeth Wallace. This story is about a little bunny who goes to school and hears the classic Aesops Fable, " The Lion and the Mouse". After the story the teacher tells the children they are going to do a "Kindness Project". She asks them to draw a picture of something they do that is kind. Minna does four things that she thinks are kind, but can't decide which to draw a picture about. She ends up using all four for her picture. When she shows her picture to the class they all think it looks like a quilt. They decide to put all the pictures together on the wall to make one big quilt. Other classes get involved and the kindness quilt keeps growing and growing. Have your children make their own kindness quilt just like the animals in the story. 2. In class have your children find two cookies that are about the same size and shape. Show them how to spread the filling on the bottom of one cookie and then place the bottom of the other cookie on the filling to make a sandwich cookie. Then show them how to wrap Saran wrap around the cookies. 3. Have them decorate a lunch bag and then place the cookies inside. Tell them that the cookies will help them learn goodness and kindness. They should think about someone, outside of the class, that they can give their cookies to. Suggest giving them to someone in the neighborhood or someone who is poor. Save some for snack time. Cream the shortening and then add the sugar, eggs, and vanilla; beat well. Add the dry ingredients and the milk alternately. Drop big gobs of dough onto greased cookie sheets. Bake at 350 degrees for 12 minutes. Cool. While you are waiting for the cookies to cool prepare the filling. Beat together all the ingredients until smooth. Match up the cookies by twos. Try to find cookies that are the same shape and size. Spread filling on the bottom of one cookie and place the other cookie on top of the filling so that the cookies are matched up bottom to bottom. I just wanted to thank you for your web site. We are a small church and I am in charge of all of the childrens classes, including Sunday School, Children's Church,and Wednesday night. That is a lot of lessons to get together. With everything your web site gives me I am able to print out the lessons, crafts, coloring pictures, and games, and then give them to my teachers. It is easy for them to understand and they love teaching. The kids love the lessons also. I did the Lost Sheep Sunday and the kids loved it. They especially loved the sheep game I made for them to play. Thank you for a web site where church's like mine can come and find great King James Bible lessons. Barbara, from Memorial Baptist Church, Cincinnati, Ohio.